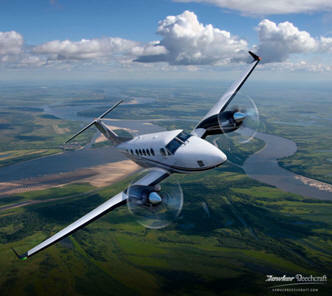 March 28, 2011 - Hawker Beechcraft Corporation announced it will feature its entire Beechcraft product lineup at the 2011 Sun ‘n Fun International Fly-In and Expo March 29–April 3 in Lakeland, Florida. The display, the company’s largest ever at the 37th annual gathering, will be highlighted with the show debut of the new King Air 250. In addition to the 250, the company will also feature a Premier IA, King Air 350i, King Air C90GTx, Baron G58 and Bonanza G36 in booth MD7-B/MD8-A at the Lakeland Linder Regional Airport. “Sun ‘n Fun provides a great opportunity to launch a new year with excitement as we proudly debut our new King Air 250,” said Keith Nadolski, president, Beechcraft Americas. “Sun ‘n Fun, with its relaxed and informal atmosphere, is a great place to showcase our aircraft and discuss the benefits of owning a Beechcraft product. We are looking forward to a great turnout and successful show.” The following Beechcraft products will be on display at the 2011 Sun ‘n Fun. Premier IA – An advanced technology light jet, the Premier IA offers customers an industry-leading combination of speed, cabin size and efficiency. With its single-pilot certification, advanced composite construction, seven-passenger seating and a top cruise speed of more than 500 miles per hour, the Premier IA offers the ultimate in operational flexibility. It sets the industry standard for being both a true “pilot’s airplane” and a serious business tool. King Air 350i – Now equipped with the Rockwell Collins Venue cabin management system and state-of-the-art Beechcraft FlexCabin capability, the King Air 350i sets the standard in cabin comfort, business capability, in-flight productivity and entertainment. It delivers unmatched fuel efficiency and the lowest operating cost per seat mile, making it the greenest aircraft in its class. The King Air 350i is the perfect addition to any corporate fleet. King Air 250 – Building on a reputation of proven performance, the next-generation Beechcraft King Air 250 features composite winglets and lightweight composite propellers, delivering improved runway performance, range, speed and enhanced climb. Passengers travel in quintessential King Air comfort, easily moving about in the spacious square-oval cabin over long-distance journeys. The King Air 250 further defines mission reliability with a ram air recovery system that maintains peak performance when the anti-icing system is activated, resulting in a high-performance, all-weather aircraft. King Air C90GTx – Key enhancements to the King Air C90GTx include an increase in gross weight and the addition of composite winglets, which improve climb performance and further increase fuel efficiency. Featuring a cabin 50 percent larger than some very light jets, the C90GTx seats up to seven passengers in its famed squared-oval design, allowing greater passenger comfort. It includes an in-flight accessible, heated and pressurized baggage storage area along with a private aft lavatory as standard. Baron G58 – The twin-engine piston aircraft that pilots aspire to own, the Baron G58 offers unmatched performance and range/payload capabilities in its segment. It also features a premium cabin that provides the best ride of any twin-engine aircraft, including flexible seating that allows for seating of two, four or six people, with the option to reconfigure and remove seats to accommodate mission needs and large baggage items. Its flight deck includes fully integrated Garmin G1000 avionics with a GFC 700 flight control system and new GWX 68 color weather radar. Bonanza G36 –The most prestigious high-performance single-engine piston on the market, the Bonanza G36 offers six passenger comfort and cabin flexibility not found in similar priced four-seat aircraft. It also features Garmin G1000® avionics and a GFC 700 flight control system, making the best selling personal aircraft the most capable Bonanza yet. Hawker Beechcraft Corporation is a world-leading manufacturer of business, special mission and trainer aircraft – designing, marketing and supporting aviation products and services for businesses, governments and individuals worldwide. The company’s headquarters and major facilities are located in Wichita, Kan., with operations in Salina, Kan.; Little Rock, Ark. ; Chester, England, U.K.; and Chihuahua, Mexico.